Plettenberg Bay is undoubtedly the most glamorous holiday resort of the Garden Route, located about 30km east of Knysna frequented by the who’s who in season. The area has been inhabited (by Europeans) since 1630 when a Portuguese crew was stranded after their ship wrecked. Since then, Baia Formosa (Beautiful Bay) has seen Dutch and English settlers. Artefacts from the 1630 wreck of the Sao Goncalo are held in the municipal offices, along with replicas of sandstone slabs inscribed and left by the crew. The ‘Art, Craft and Antique Route’ takes in antique and collectable shops, galleries and tea gardens. Some of the old buildings include the provincial heritage site of the Old Timber Store, as well as the century-old buildings of St Andrew’s Chapel, St Peter’s and the Dutch Reformed Church. Mother Nature has smiled on Plett, as luscious forests, marshy lagoons and estuaries, and three beautiful beaches grace the area. It is sheltered in the west by a natural 4km breakwater, whose rugged cliffs and rocky coastline is a perennial favourite for fishermen. Archaeological findings unearthed at Nelson’s Bay Cave and Matjes River Cave suggest that Middle Stone-Age beachcombers roamed the area. If you take a stroll along the beach you might be lucky to find a rare pansy shell. For those who are interested in the history of the whaling industry, the original slipway and blubber cauldron on Beacon Island should not be missed. 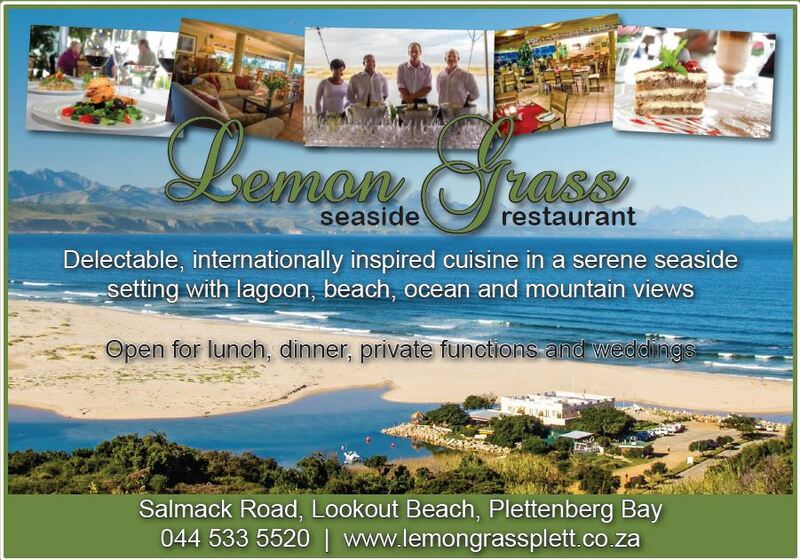 Particularly in summer, Plettenberg Bay comes alive at night with pubs, nightspots and fine restaurants. Wonderfully scenic drives along the coast and through Nature’s Valley, the Robberg Nature Reserve and theTsitsikamma Forest will enchant visitors. Include a visit to the Jukani Wildlife Sanctuary, Birds of Eden and Monkeyland eco projects which offer great experiences. Birds of Eden provides sanctuary for more than 3,000 previously caged birds. The 80-ton dome of the sanctuary has 1.2km of walkways, a 200-seat amphitheatre, a walk-behind waterfall and restaurant facilities. The area is a paradise for outdoor enthusiasts with excellent hiking, mountain biking, horse-riding and canoeing trails. The challenge of the world-famous Otter Trail hike can be taken up from within the Tsitsikamma National Park. Water sport is extremely popular in Plett and travellers can swim, surf, scuba-dive, snorkel and sail in the waters of the Bay, or enjoy rock and surf fishing. Did you know? The highest commercial bungee jump in the world, with a height of 216m and a 7-second free fall, is at the Bloukrans River Bridge.